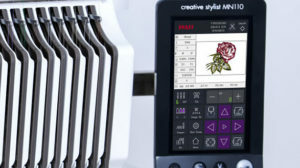 Embroidering large projects or a large quantity of projects is easier and faster with the intuitive creative stylist™ MN 110 multi-needle machine. 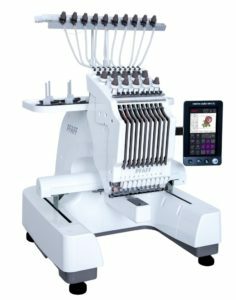 Single Head with 10 Needles – Embroider complex designs in a fraction of the time! Large Embroidery Area – Embroider designs up to 12″ x 8″ (310 x 210 mm) in one hoop. Automatic Color Change – The PFAFF® creative stylist™ MN 110 automatically moves to a different needle with every color change indicated in the design. Large 7″ Color Touch Screen – The 7″ (178mm) HD LCD true color touch screen features a naturally intuitive interface, A multi-angle, rotatable and adjustable control panel bracket allows for better visibility. Automatic Thread Break Detection – The creative stylist™ MN 110 will stop and alert you automatically when any thread breaks. 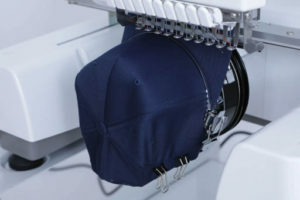 Automatic Thread Trim – The machine will automatically cut threads with any jump stitch, trim or color change command. PLUS, trim any thread at any time with the easy-access thread trim button. 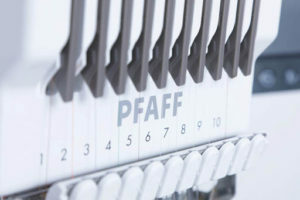 Reads VP3 Designs – Use the same embroidery designs as your other PFAFF® sewing and embroidery machine. The machine will also read DST format designs. Color Selection – Choose the order in which your machine uses its 10 spools – no need to arrange your spools in order between every design. Smart Save – Never miss a stitch! If your machine stops suddenly or if you need to stop your embroidery for whatever reason, the Smart Save feature will remember the last stitch sewn. This way you can start on that exact same stitch when you turn your machine back on. 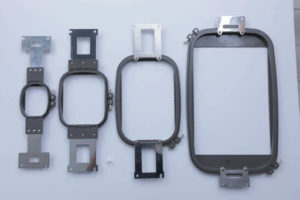 Large Memory – Save up to 20 million stitches or 200 designs directly on the machine. USB Port – The USB port is located on the side of the Control Panel to save and load designs with ease. LED Lighting – 5 built-in LED lights provide superior visibility for every needle and every stitch. Small Sewing Arm – At only 2″ (50mm), the small sewing arm gives you the dexterity to embroidery more items. Language Selection – Choose from 14 different languages to make sure your PFAFF® creative stylist™ MN 110 embroidery machine speaks the same language as you do. Complimentary Designs – 101 built-in embroidery designs. 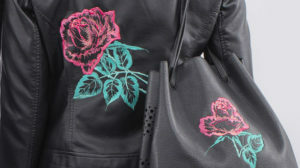 Free Premier+2 Intro Software Activation Code – Take your embroidery even further with the Premier+2™ Intro Software. 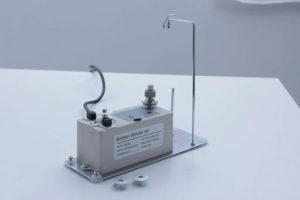 Bobbin Winder – A separate Bobbin Winder Set comes with your machine. You can wind bobbins while your machine is stitching so you do not miss a beat. Ask us about the creative stylist™ MN 110.